Office of International Education Celebrates and You Can, Too! Campus Recreation Center (CRC) Gift Certificates Now Available! Need Georgia Tech Gift Ideas? As many of you are already aware, this is the last week of class for the fall semester and final exams take place next week. Students are busy finalizing group projects, writing papers, and other assignments, while also preparing for finals. This is a good time to make sure your student is prepared. Getting proper sleep, eating right, and taking small breaks from studying from time to time can help. Be sure to let your student know you are proud of them, you recognize their hard work and that you love them. Understand that students may need some additional space as they prepare for exams. Conversely, students may become homesick and reach out for comfort during this stressful time. Offer support by calling, texting, sending emails or a care package. I hope that you find this last newsletter of 2015 helpful. Wishing your family the BEST during this time of the year! News and views about students’ career development from Dr. Michelle Tullier, executive director of the Center for Career Discovery and Development. Many students start at Georgia Tech with exceptional focus. They come here because they know they want to be a chemical engineer, an architect, a business leader, or a public policy expert, for example. Many do keep this focus throughout their years at Georgia Tech. They are satisfied with their major. They engage in experiential education to develop practical skills. If this is the case, there’s no need to fix what’s not broken! But don’t let your expectations run wild. Just because your son or daughter is on track toward a successful career doesn’t mean there won’t be bumps in the road. A clear focus in second year could start to waver by third year. Or a graduating senior who’s done all the right things might find the job search a little more challenging than anticipated. For now, be grateful that your student is on the right path, but don’t let yourself be lulled into complacency only to be blindsided by a deviation in the future. What about those students who are not so focused? Maybe they began college with a clear direction but have begun to doubt their choice of major or area of specialization. At spring break your son told you he wants to go in a new direction, then after testing out that direction through a summer internship he decided to go in a newer direction, and by Thanksgiving or winter break he has a “newest” direction. Your head is spinning with all the changes and you’re concerned he is floating along without a rudder. Your best strategy is to be understanding and patient, as well as to remind your student of the support available on campus. C2D2 has career counselors on staff to help students assess who they are and explore what’s out there for them in the world of work so they can make sound decisions. For those who say they don’t have time to think about career planning, encourage them to spare thirty minutes to speak with a career advisor who can help them break down career planning activities into bite-size chunks. What if you see that your student needs career help and isn’t willing to ask for it, much less accept it? Or, perhaps your son or daughter is on track but you have something more to offer. Perhaps you are well connected and have contacts to share. You are eager to share what you know or who you know but your student isn’t receiving. Recommended strategy here? Don’t beat your head against a wall. Know that your child is probably going to have to hear it from somebody else even if that somebody else is saying the same thing you are. And those great contacts you have? Offer up the names, explain why you think your student can learn something from each contact, and then leave it be. While you daughter or son might not fit perfectly into one of the composite types above, consider elements of these as you interact with your student around the topic of careers. Both finals and Winter Break are right around the corner. For most Georgia Tech students, this means that focus is at a minimum when it needs to be at a maximum. It’s crunch time as professors try to fit everything in before the end of the semester, but in the midst of schoolwork, dreading finals, and anticipating a break, how can students stay focused? Research completed by the Office of Institutional Research and Planning found that Georgia Tech students who frequently visit the Campus Recreation Center (CRC) have higher GPAs and are more likely to return to Georgia Tech the following year. The study also concluded that those who never visited the CRC represented a significant portion of students who had the lowest grade point averages and, more importantly, did not continue school at Georgia Tech! While there are a number of influential factors in the academic performance of our students, data analysis indicates “that the difference in retention rates are not due to chance alone – frequency of CRC visits does play a role.” For many students, finals make or break students’ grades in their classes, and the CRC is an excellent focus booster in approaching such an important time of the semester. 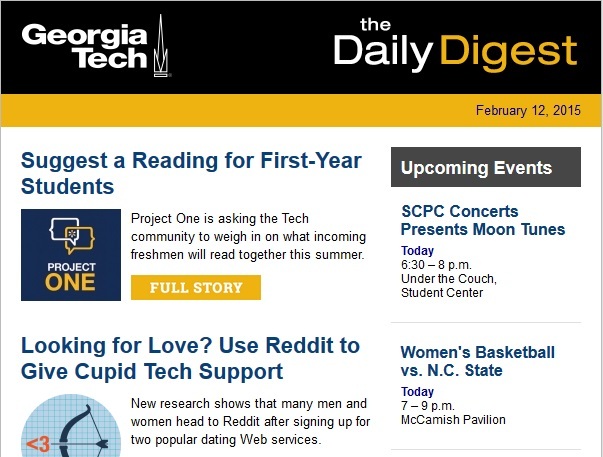 “The Campus Recreation Center is a resource that, when fully utilized, enables the Georgia Tech community, particularly its students, to practice healthy behavior,” the report concluded. Going beyond the outstanding education that Georgia Tech offers, regular use of the CRC provides many additional benefits that are important to developing a balanced, healthy lifestyle. All classes are FREE during Finals Week for CRC members – click here to view the schedule. Encourage your student to utilize the CRC in preparation for their finals– their focus will increase, and the studies show that their GPA’s will appreciate it! Lock your door before you leave. If you share your residence with a roommate, remind them to always lock it and let them know your schedule for returning. Secure your windows and lock them. Close the blinds or curtains. This will decrease the chance of someone looking into your dorm room when you are away. Your BuzzCard is more than identification. 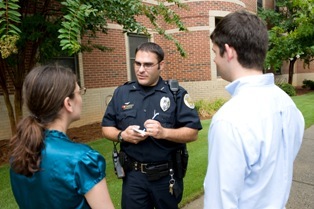 If you lose your BuzzCard be sure to report it immediately so we can deactivate your card. Otherwise, someone else may be dining on your BuzzFunds. Conceal any money or valuables in a diversion-type safe or other locked container. Diversion safes come disguised as a number of familiar commercial products and can hide your valuables without attracting any attention to them. Take expensive electronics with you. If you cannot take it with you make sure to place it in an area that is out of plain sight, for example in a drawer, under the pillow, in a closet behind or beneath clothing. To help cope with the stresses of finals week, students should really take some time to relax and recharge by getting a bite to eat. On Tuesday, December 8, of finals week from 10 p.m. to midnight in the Student Center Food Court, FREE breakfast will be served by the Georgia Tech faculty and staff! While it may not be exactly like home, Midnight Breakfast helps provide the nourishment and support needed while studying for final exams. This year from from 7-10 p.m. students will also find relaxing activities on the third floor of the Student Center. Students are encouraged to wear their pajamas for a chance to win GT Night at the Aquarium tickets. Activities include massages, yoga, puppies, games, crafts and more! Click here to view photos from last fall's Midnight Breakfast! This event is made possible by the Parents Fund for Student Life & Leadership, the Student Center, and Campus Services BuzzFunds. Chabad's Annual Chanuka Party & Menorah Lighting will take place this year at the Campanile on Tuesday, December 8 at 6 p.m. We are honored to have President Peterson and Mrs. Peterson join us in lighting the first candle. Parents and family are invited to attend. Chabad has organized gift packs, filled with everything parents want to send their children at Chanuka and exam time, to be delivered to students. Packs include chocolate gelt, home-baked goodies, menorahs and a lot more, plus a personalized note from you. Visit ChabadGaTech.com/ChanukaPackage for more info and to send one to your favorite student. Did you know that Georgia Tech and the Office of International Education (OIE) are about to celebrate a major milestone? OIE is about 500 students away from sending its 20,000th student abroad! To celebrate and achieve this goal as quickly as possible, OIE is giving one lucky student a free airfare voucher with a value of up to $2,000 for their study abroad experience on an exchange or faculty-led study abroad program. Students applying to summer 2016, fall 2016, or 2016-2017 academic year study will be eligible for this once in a lifetime offer. So, if you’ve been putting off studying abroad, now is the time. Students must actually study abroad during the semester for which they have applied. If they decide to cancel or defer their study abroad experience, they will lose the free airfare and the prize will be given to the next eligible student. So, the question is—what is your student waiting for? Click here for more information. Detailed information can be found on our housing website, housing.gatech.edu. New Spring 2016 residents can move in on Sunday, January 10, 2016. The spring Campus Housing Application is still open for new students or returning students who are not residing on campus this fall, and the application can be accessed through “My Housing” on the Georgia Tech Housing website. If your student has not yet applied – it’s not too late! Our assignment staff is available to answer questions and offer assistance at 404-894-2470 and information@housing.gatech.edu. We hope all of our residents have had a successful semester and have a relaxing break. Georgia Tech will celebrate its 250th Commencement at McCamish Pavilion. The PhD and master’s ceremony will take place Friday, December 11, at 7 p.m. The bachelor’s ceremony will be held on Saturday, December 12, 9 a.m. to 11:30 a.m. with doors opening at 7:30 a.m. We encourage guests to arrive early for general seating. The bachelor’s ceremony is a ticketed event. Visit the commencement website, www.commencement.gatech.edu, for more information. In addition, we encourage all parents and their guests to share in the excitement of Commencement with their graduates at the President’s Graduation Celebration, held Friday, December 11, from 3–5 p.m. in the Student Center Ballroom. Families and graduates will have an opportunity to take photos with beloved Tech mascots, meet administrators, faculty, and staff, and share in unique traditions that make Georgia Tech such a cherished institution. Are you looking for the perfect holiday gift? Give the gift of the CRC! Gift certificates can be purchased for any Georgia Tech Student! Gift certificates can be used for personal training, GIT FIT semester passes, massages, and much more! Parents, gift certificates make stocking stuffers for your student! Visit our website for more information or call CRC Member Services at 404-385-7529. Visit the following website for a great selection of Georgia Tech gear that is perfect for your Yellow Jacket! The Department of Housing is looking for new Student Leaders in Georgia Tech’s Residence Halls! We have a total of 287 Resident Advisors and Peer Leaders serving our students in our residential communities. The function of the Student Staff Member (SSM) position is to work with residents to facilitate and develop a community environment within residence halls which will contribute to the intellectual, social, and cultural growth of their residents which will result in increased academic success and retention for these participants. The SSM works closely with the Hall Director in order to maintain a level of consistency both within the area and within the department. The student staff position requires dedication, flexibility, commitment, and enthusiasm as the staff member will actively respond to the changing needs and situations with residents. The SSM works directly with the Hall Director and receives additional direct supervision and training from the Hall Director and department. The application will be available from November 2 to January 20. Please visit http://housing.gatech.edu/reslife/employment/Pages/Student-Staff.aspx for more information. 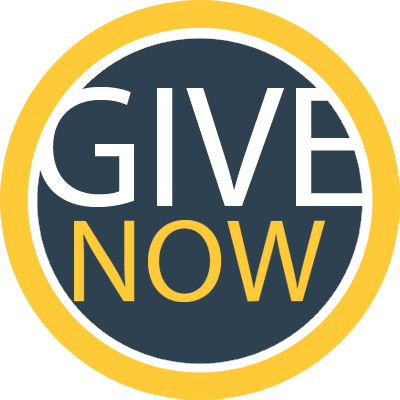 Please be sure to submit your tax-deductible gift before the end of the month in order to receive credit for 2015 tax year. 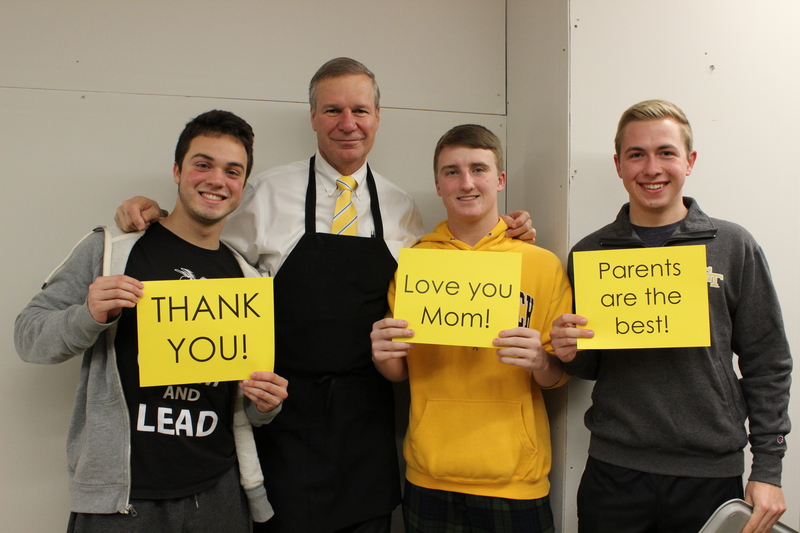 Remember, all gifts to the Parents Fund support student-led organizations that promote the health, safety and well-being of your student. Give today! How are you feeling about final exams? Stress and final exams go hand-in-hand. Most students feel a lot of pressure at the end of the quarter and this may lead to anxiety. Georgia Tech Counseling Center has a wonderful webpage just for parents and families with lots of resources. Click here to learn more. Ahhh – home for the holidays. You are most likely very excited to have your student home for an extended period. It’s a great time to reconnect and have extra hands to help around the house. However, your student may be thinking that winter break is a good time to catch up on sleep, eat home-cooked meals three times a day, and maintain his/her freedom to come and go as he/she pleases. Taking time to discuss each other's hopes and goals for the break may help avoid conflicting interests and make for a more peaceful holiday. Help the Parents Program by Booking Your Travel! Are you booking trips for your student to come home for the holidays or break? Need to book air travel, hotels or rental cars? If so, we encourage you to use the link below to book that next trip! A percentage of your purchase will come back to the Parents Program and will help fund other events for Georgia Tech students, parents and families. Thank you in advance for your support! Click here to learn more and support the Parents Program. 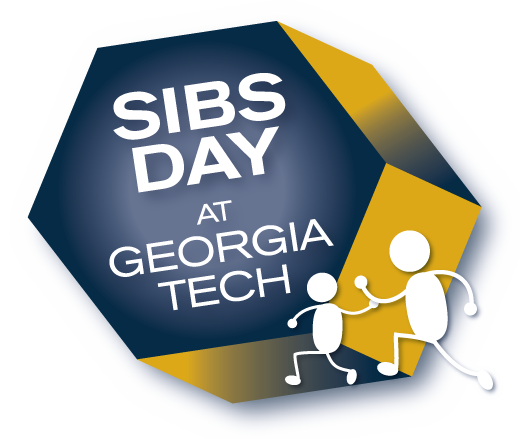 Sibs Day will be held on February 20, 2016 and registration will open on Friday, January 8, 2016. Check with your Georgia Tech student and family over the winter break to see if they are interested in attending this fun day together! Parents are also invited to join their family at 8:00 p.m. that night to watch the Georgia Tech vs. Notre Dame Men's Basketball game at McCamish Pavilion! Visit parents.gatech.edu/sibsday for more information. 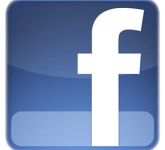 Have you sign up for our Parents Program Facebook page yet? Like us today to stay connected over the summer!